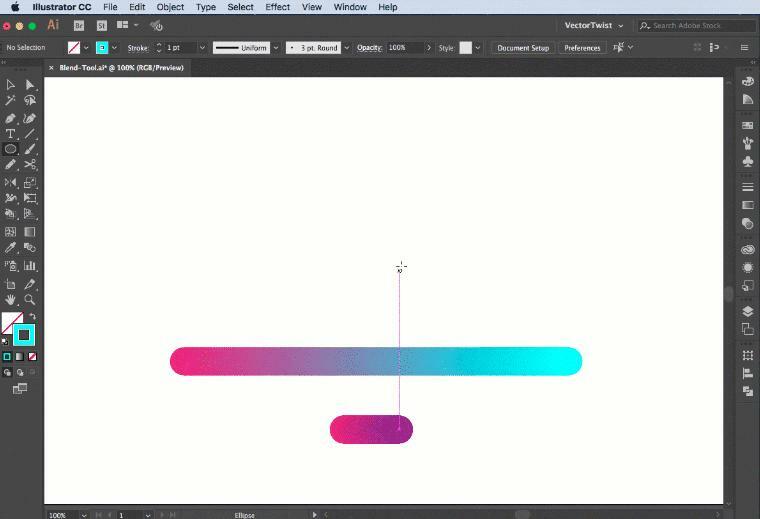 In Adobe Illustrator, the Blend Tool can help you create impressive color blends. 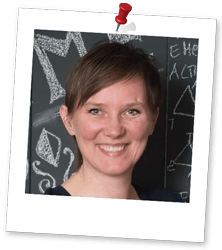 It is often underused or not fully understood and can be confusing to a beginner. Let me explain the most important things about the Blend Tool. The easiest blend you can make is blending two different colors applied to two shapes of the same form. This helps you to get an understanding of the Blend Tool and it’s fun to see how the colors mix. 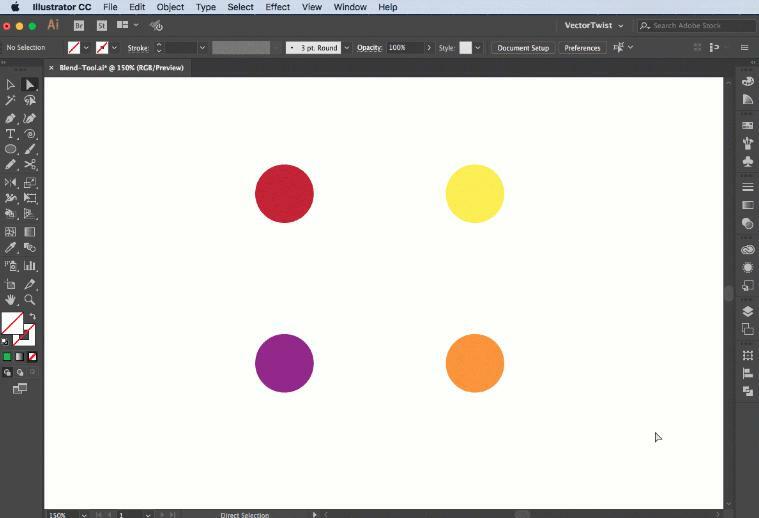 Simply create two circles of the same size and give each a different fill color. Set the stroke to none for now. 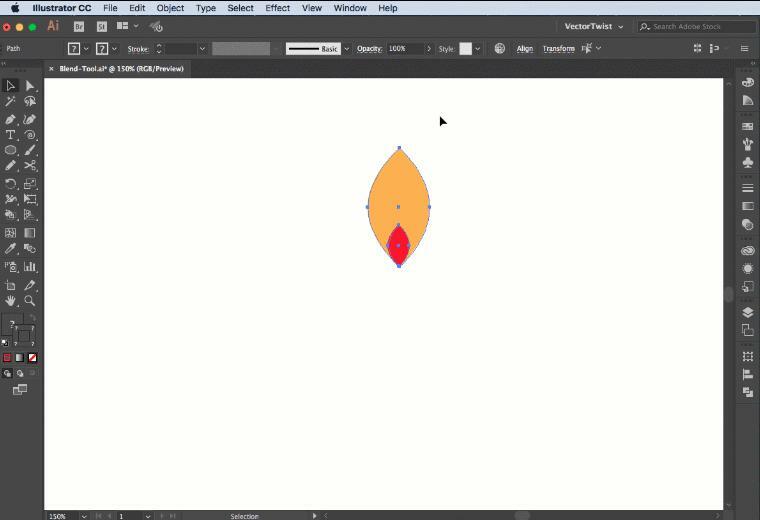 Then select the Blend Tool in the Tool Bar (Shortcut is W) and click on the first shape, then click on the second shape. There you go. A blend has been born! You can blend objects of a different shape into a new shape. Basically, the blend will crete a morph of the two shapes you select. For example, create a star shape of any color and then a square of any color. 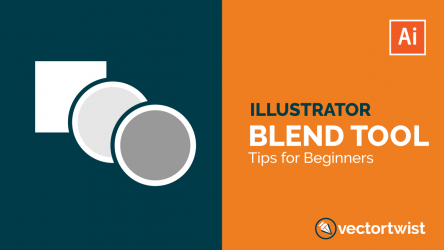 I showed you the Blend Tool (W) before, but you can apply a blend with the Make Blend command. Simply select both shapes, then go to Object > Bend > Make. This will create a blend of the two shapes. 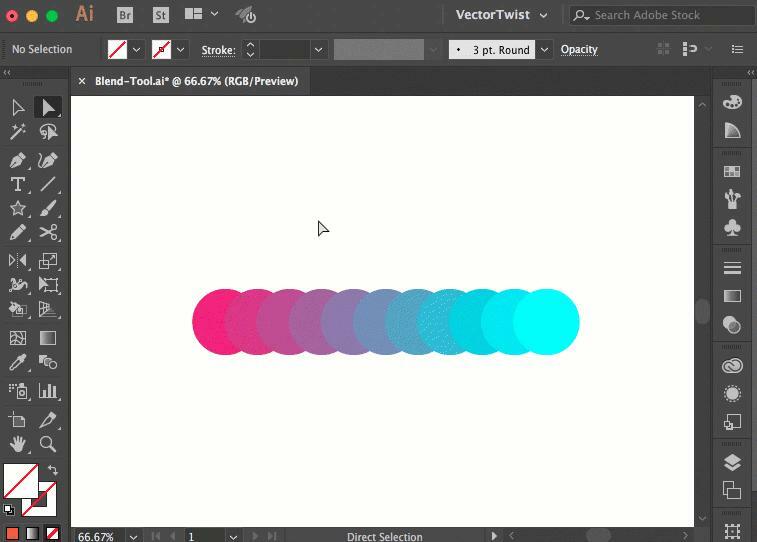 By default, Illustrator calculates the best number of steps to create a smooth color transition between the shapes selected. In order to control the number of steps or distance between steps, we can set different blending options. 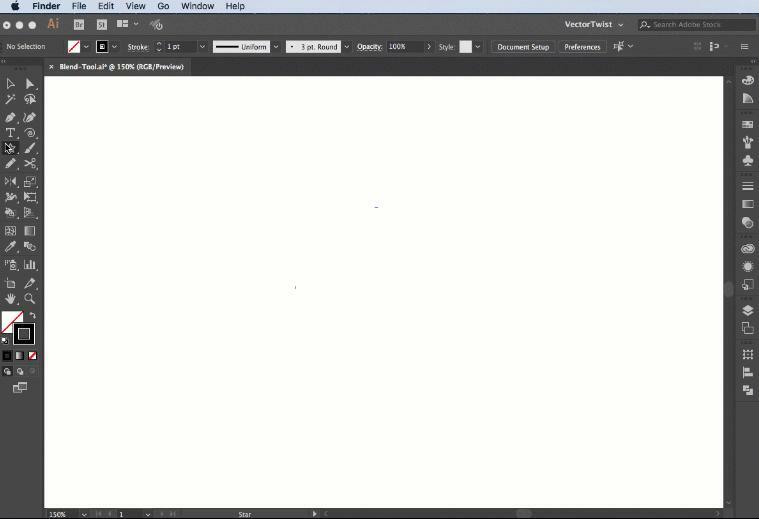 Simply select the objects with a blend applied, then go to the Blend Tool and double-click it. The Blend Option window will appear and here we can change the spacing. We can choose from three options. Alternatively, we can also change the Blend Options via Object > Blend > Blend Options. Just remember to select the blended object first, in order to change options for the existing blend. Illustrator auto-calculates the number of steps for the blends. If for example objects are filled or stroked with different colors, the steps are calculated to provide the best number of steps to create a smooth color transition. We can select the Blend Option – Smooth Color via the Blend Options window. 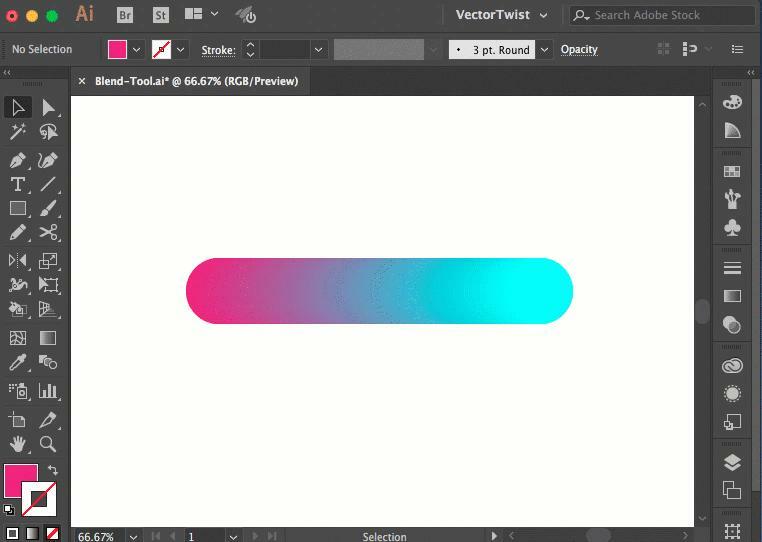 This is great for creating gradients and smooth transitions with the Blend Tool. This Controls the number of steps between the start and end of the blend. 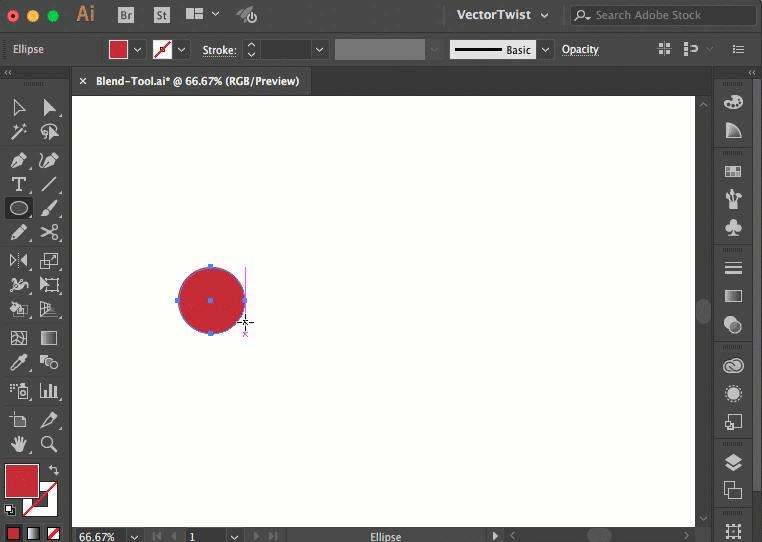 If we have two circle shapes and we want only 9 steps in between both, we can select the Blend Option – Specified Steps via the Blend Options window. This is the distance between the steps in the blend. The distance specified is measured from the edge of one object to the corresponding edge on the next object. Let’s say you have two circles and blend them together and you would like to have an equal distance in between each circle, you can apply the Specified Distance Option via the Blend Options. This options determines the orientation of the blended shapes. Once the Blend Tool has been applied, you can change the blend orientation via the Blend Options. A. Align to Page will orient the blend to the x axis of the page in a perpendicular matter. B. Align to Path will orient the blend to the path in a perpendicular matter. Each Blend will have a path assigned. 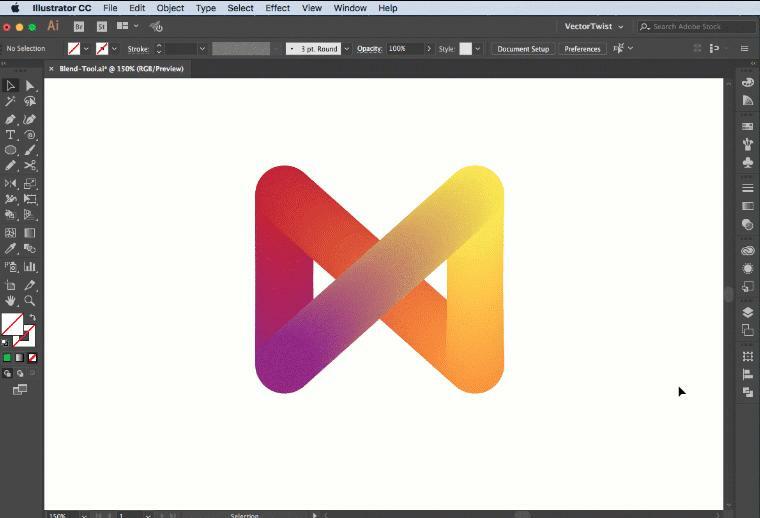 No matter which shapes you selected, every time you applied a blend, you will notice a path between both. By default, the path (spine) forms a straight line. You can easily change the path (spine) by using the Direct Selection Tool (A). Select an anchor point and drag it to a new position. 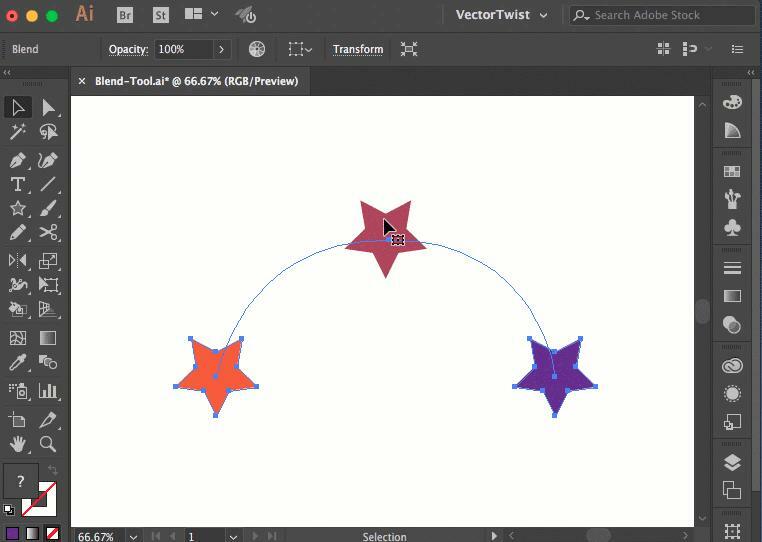 Add or delete anchor points with the Pen Tool. Alter anchor points with the Anchor Point Tool. Sometimes you want to create a blend along a specific path you created. This can simply be achieved by replacing the spine (path) of the blended objects. To replace the spine with a different or new path, simply draw your new desired path that you want to use as the new spine. Select the spine (path) object and the your blended object, and go to Object > Blend > Replace Spine. You can reverse the order of a blend on its spine. When is this useful? For example, you have a blended object, two circles blended along a curvy path. One circle is bigger on the left, the second circle is smaller. You will have a blend going from big to small along the spine. In case you want to reverse the order, simply select your blended object and go to Object > Blend > Reverse Spine. This will then reverse the blend going from small circle to big circle! 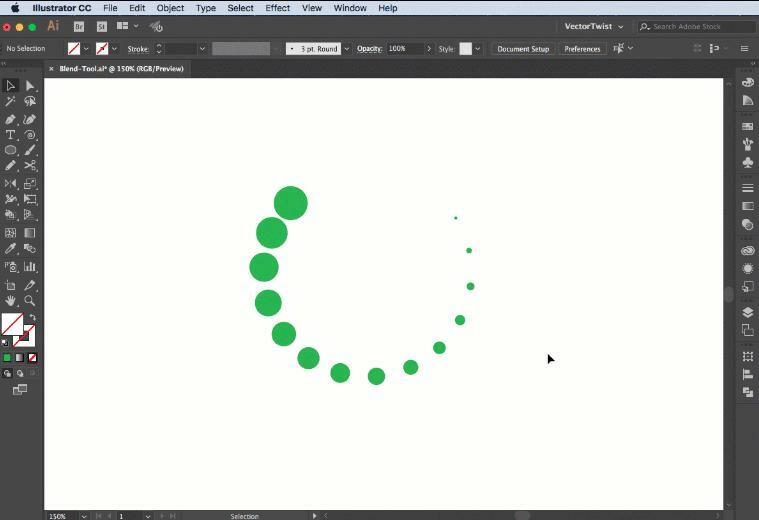 With the Blend Tool you can easily blend together multiple shapes. The order of the shapes is important. For example, let’s create several circles, in different colors. Then we select the Blend Tool (W) and click on each shape in the order we want them to blend. Basically, click on the first shape, then the second, then the third and so on. When blending shapes, a stacking order is created. We can change this order by reversing it. Let’s use the example of the multiple circle blend. In order to change the stacking order, select the blended shapes, go to Object > Blend > Reverse Front to Back. This can be applied to any blended objects. We can use the Blend Tool to morph shapes into each other. This works well when you want to create highlights. For example, here is a circle and you would like to create a highlight on top, all you need to do is create another shape with the desired highlight color and then apply the Blend to both shapes. Now we discovered the basics of the Blend Tool in Adobe Illustrator. Things don’t have to stop here. Get creative and apply blends where you haven’t before. Try out shapes just with a stroke color applied, blend lines together, create complex shapes and blend them. The possibilities are endless! 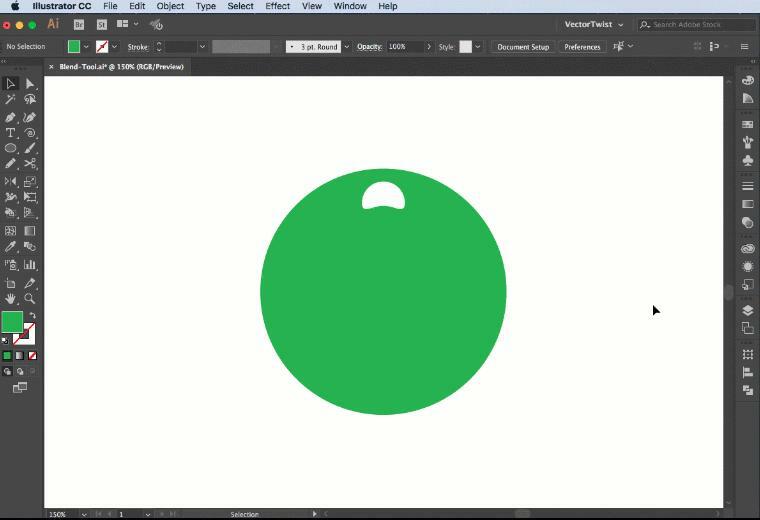 In Adobe Illustrator, the Blend Tool can help you create impressive color blends. Of course, you can use the Gradient Tool or even the Gradient Mesh Tool, but one advantage the Blend Tool has over other tools, it is a Live Tool, meaning that you can change its object or shape, its color or position, and the blend will be updated live. 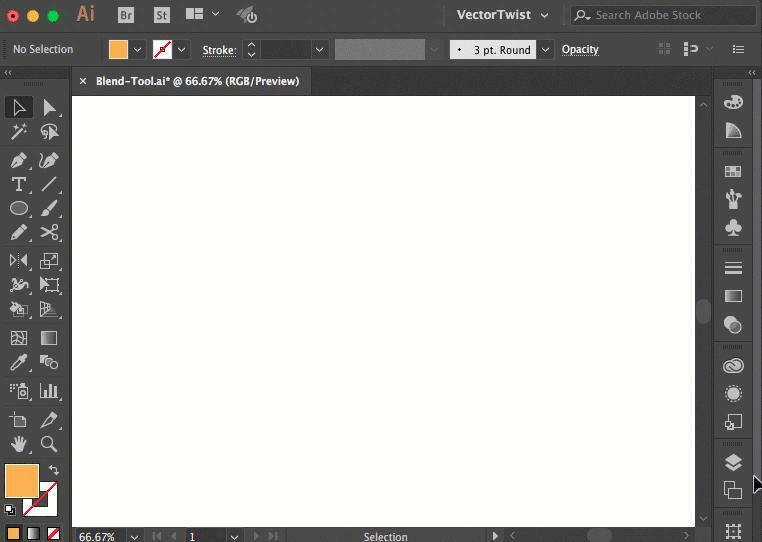 You can create blends either with the Blend Tool (W) or the Make Blend command (Object > Bend > Make). One thing to remember though, the Blend Tool takes a lot of computing resources, so it may slow down your computer. Send me your creations and I’ll post them here on vectortwist.com. I will share them with the community! Thanks! If you liked this post share it and subscribe to the newsletter, so you’ll be always up to date! You are amazing! Keep doing what you do dear Simona, and I love your accent too! Thank you Grace, very cool!